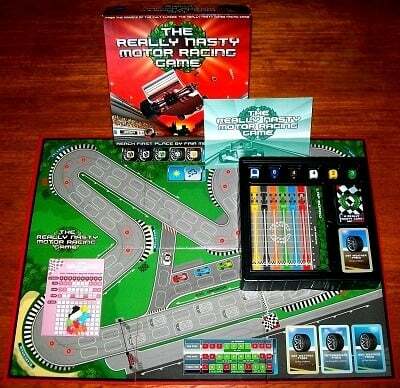 'THE REALLY NASTY MOTOR RACING GAME' BOARD GAME: From the makers of the cult classic: 'The Really Nasty Horse Racing Game'. No driving ability needed - only those prepared to plot, scheme and make bitter enemies of their closest friends will take the road to victory. Only the downright devious will triumph. Conjure up a spot of wet weather just as your opponent leaves the pit lane with dry weather tyres or cause a failure in their pit crew's equipment. Increase your chances with a craftily-placed oil spill or decide to give the leading driver a puncture as they near the finish line. The is no ordinary race: this is a really nasty race. This game is in complete and excellent condition throughout. The game box, which shows some signs of wear, is in good, clean condition and every corner is fully intact without any use of sellotape. The game board, aside from very minor wear to its reverse, presents itself in immaculate condition; there is no play-wear whatsoever to the playing surface. Every card and playing piece is in brilliant condition and this particular example, which has clearly been used only a handful of times, benefits from a very generous compliment of score sheets.